MINNEAPOLIS & REHOVOT, Israel—Dec. 6, 2016 –(BUSINESS WIRE)–Stratasys Ltd. (Nasdaq:SSYS), the 3D printing and additive manufacturing solutions company, today announced that its full-color, multi- material J750 3D Printer, played a key role in UK supermarket giant, Sainsbury’s, 2016 Christmas TV advert. Shot entirely in stopframe animation, the TV advert, a joyous musical entitled ‘The Greatest Gift,’ features a number of different characters, the faces of which were all produced on the Stratasys J750 3D Printer by 3D Print Bureau and Tri-Tech 3D. According to Richard Pickersgill, workshop supervisor at puppet makers, Mackinnon & Saunders, the Stratasys J750 secured its part in the production for several key reasons that made it a winning choice above the alternative method of traditional figure molding. 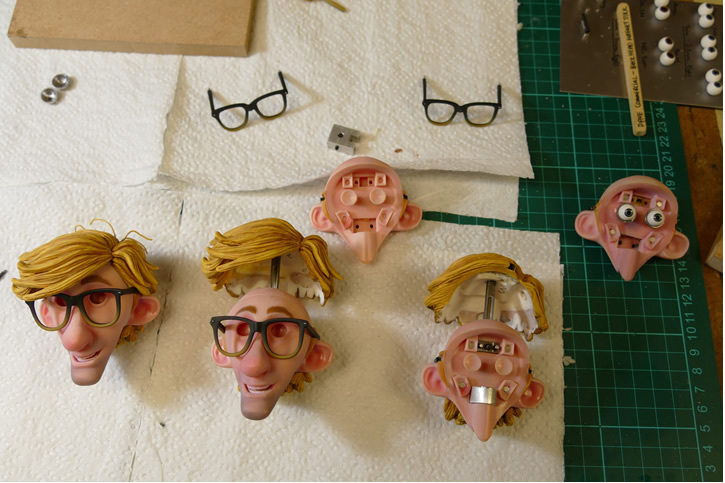 “A total of over 1400 3D printed faces were required for this production, including 800 separate models depicting different expressions for the main character alone,” he explains. Directed by Sam Fell and sung by James Corden, the three-and-a-half-minute mini-film centers around family dad, Dave, who discovers a way to spend more time with his family at Christmas. According to Pickersgill, the elaborate production needed a technology capable of delivering fine detail and high quality color, but within a strict timeframe. “The attributes of the Stratasys J750 3D Printer offered us the best all-round solution; we found that other technologies just didn’t offer everything we wanted,” he explains. The large quantity of faces required for this project, also favored a technology that would limit the amount of post-processing work by eliminating the need to remove and clean-up the physical support structure and painting. According to Gary Miller from 3D Print Bureau – the service bureau tasked with printing the numerous faces – the enormity of the project’s need for more than 1400 pieces, saw Stratasys reseller, Tri-Tech 3D, also enlisted to support the 3D printing effort. Currently being broadcast on UK TV, production of ‘The Greatest Gift’ required the close collaboration of several separate parties, including: animation studio, Passion Pictures; puppet makers Mackinnon & Saunders; technical CG modeler Glen Southern/Southerngfx; 3D printing service bureau, 3D Print Bureau; and Stratasys reseller, Tri-Tech 3D. To see the full musical and festive advertisement and explore the potential of 3D printing in stopframe animation, see the video here. For more than 25 years, Stratasys Ltd. (NASDAQ:SSYS) has been a defining force and dominant player in 3D printing and additive manufacturing – shaping the way things are made. Headquartered in Minneapolis, Minnesota and Rehovot, Israel, the company empowers customers across a broad range of vertical markets by enabling new paradigms for design and manufacturing. The company’s solutions provide customers with unmatched design freedom and manufacturing flexibility – reducing time-to-market and lowering development costs, while improving designs and communications. Stratasys subsidiaries include MakerBot and Solidscape, and the Stratasys ecosystem includes 3D printers for prototyping and production; a wide range of 3D printing materials; parts on-demand via Stratasys Direct Manufacturing; strategic consulting and professional services; and the Thingiverse and GrabCAD communities with over 2 million 3D printable files for free designs. With more than 2,700 employees and 1,200 granted or pending additive manufacturing patents, Stratasys has received more than 30 technology and leadership awards. Visit us online at: www.stratasys.com or http://blog.stratasys.com/, and follow us on LinkedIn. Stratasys, Fortus, FDM, and GrabCAD are registered trademarks, and the Stratasys signet, 900mc, and GrabCAD Print are trademarks of Stratasys Ltd. and/or its subsidiaries or affiliates. ULTEM is a registered trademark of SABIC or its affiliates or subsidiaries. All other trademarks are the property of their respective owners. This entry was posted in News and tagged 2016 Christmas TV advert., 3D Print Bureau, animation studio, Gary Miller, Glen Southern/Southerngfx, James Corden, Mackinnon & Saunders, Passion Pictures, Richard Pickersgill, Sainsbury’s, Sam Fell, Stratasys J750, Stratasys Ltd., The Greatest Gift, Tri-Tech 3D by AM. Bookmark the permalink.